On Friday morning, while biking to work alongside a couple of Garden Street joggers, the sweet sound of a cardinal’s song made me take notice. It was the first cardinal song I had heard in 2011. When I drove through Mt. Auburn cemetery today, most cardinals were silent, but a couple did sing in anticipation of spring. In March and April, I go to the cemetery oftener than usual because the birds start singing and the warblers arrive, and they are easier to find because there are no leaves on the branches yet. But, this post is about the black-capped chickadee, Massachusetts’s tiny state bird, about which I’ve been reading lately in Birdsong: A Natural History, a lovely book by Don Stap. Chickadees are named after their call “chick-a-dee-dee-dee” , made by males and females and easily heard in many wooded areas in the US. Less well-known is the song of the black-capped chickadee, a whistled “fee-bee-ee”. Nearly all songbirds learn a song with a basic structure and some small variations. These variations tend to be peculiar to the area in which the bird is found. For example, song sparrows in California make a slightly different sound from those in Massachusetts – a sort of avian dialectic variation. There is probably an evolutionary explanation to this – a bird with a slightly different song, or a larger vocabulary of songs is more likely to find a mate. Now, it so happens that chickadees are unique among songbirds in one aspect of their song. Male chickadees all over North America have the same song! The same whistled “fee-bee-ee”, also referred to as “hey-sweetie”. This is striking because it is so rare: a black-capped chickadee in Montana sings the same pattern of notes as that of a chickadee in Massachusetts. That was the conventional wisdom, until Prof. Don Kroodsma of the University of Massachusetts found exceptions to the rule. Kroodsma is the author of The Singing Life of Birds: The Art and Science of Listening to Birdsong. 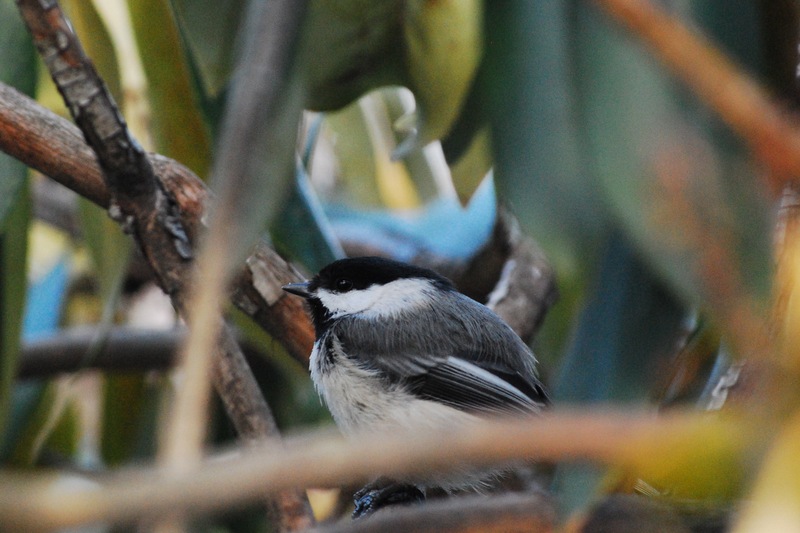 He noticed that, on the island habitats of Nantucket and Martha’s Vineyard, some black-capped chickadees sing the inverted “sweetie-hey” or “sweetie-sweetie” instead of “hey-sweetie”. I’m not far enough into Stap’s book to know why this is the case, but was intrigued enough to pay closer attention to a chickadee song the next time I heard it. Indeed, today, as I stood observing chickadees, cardinals, titmice, nuthatches, sparrows and red-winged blackbirds partake of a feeder’s bountiful supply of birdseed, I perked up my ears as sounds of “hey-sweetie” punctuated the numerous “chip”s and “chuck”s made by the various birds. Then, from a tree behind me, came a different chickadee song. I am sure that, if I hadn’t been reading that particular chapter from Birdsong, I’d have clubbed it with all other chickadee songs that I was hearing. To make sure that my mind wasn’t playing tricks on me, I (fumblingly) tried to record the sound on my phone. And since the WordPress mercenaries will not let me add the audio unless I pay them, I have to link to a horribly jerky video that I’ve put up on Youtube. To prevent vertigo, I urge you to close your eyes and listen only to the sound :). You may need to turn up the volume. Does it not sound unmistakably like “sweetieeee-hey”?! Now, the funny thing is, even though I hear it as “sweetie-hey” and sometimes “sweetieee-sweetie”, it is quite different from the Martha’s Vineyard chickadee recording that Audubon Magazine has on its website. For my chickadee from Mt. Auburn, there are two distinctly audible kinks in the sound while the recording from Martha’s Vineyard has one audible kink and one extremely subtle kink that would only be discernible in a sonogram. All this begs the question: Was I listening to a chickadee that has wandered over from one of the islands? But Don Stap writes that they don’t like water crossings and will try to avoid them when necessary. Or is the first kink in the audio just an aberration? Or, have I just been over-excited by this particular sound, which is one of the known versions of the mainland US black-capped chickadee song that I am unaware of because my experience with birdsong is so limited? I’m wondering: should I send this to Mass Audubon for clarification? A cardinal was singing as I walked to the bus stop this morning. I love to hear them because they are the earliest “big” bird to start singing here as winter winds down. The small songbirds – sparrows and chickadees usually – hang out all winter. Since the sun is coming up earlier now they are all starting their morning ruckus as I leave for work and I do so love it. It will probably be another 3-4 weeks before any robins show up but I am so looking forward to it. The robins here are generally quiet so far, Stefanie. But, I find that on warmer days, they are coming out on the lawns. Not dozens, but twos and threes. Even in Mount Auburn Cemetery, they seem to prefer the wide open spaces to the shady areas. Last weekend, finally, I heard two of them singing a nice competing duet near Willow Pond (the place I wrote about some months ago).